Pete Anderson, 36, front, places a mid section kick as Master Chuck Crone gives foot placement instructions during practice on Wednesday evening at his business in New Kingstown. Master Chuck Crone, owner of Crone's Tae Kwon Do, New Kingstown, gives instruction to Hussein Aldasam, 15, on placing a mid section side kick during class on Wednesday night. 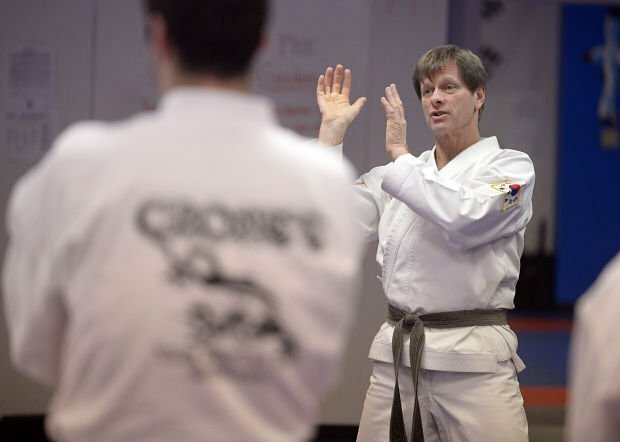 Master Chuck Crone of Crone's Tae Kwon Do, New Kingstown, demonstrates effective ways of using pressure points to incapacitate an attacker to his students on Wednesday night. Master Chuck Crone, owner of Crone's Tae Kwon Do, New Kingstown, deonstrates short distance striking effectivness with Sunil Sharma, 40, during class on Wednesday night. 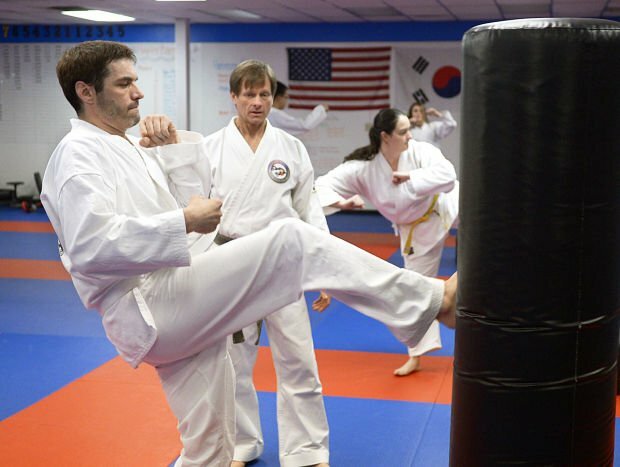 Master Chuck Crone of Crone's Tae Kwon Do, New Kingstown, right, teaches kicking examples to Jennifer Anderson, 31, left, during class on Wednesday night. “Five new students is an average month, so it is a big rise,” he said. Suk Yee Smith, a fourth-degree black belt in Kenpo and instructor at The Dragon’s Way School of Kenpo in Carlisle, said she also has seen a considerable rise in those interested in learning self-defense. Smith reported a 50 percent rise, similar to Crone’s. “Any time any good movie comes out, for instance with kids, with “The Karate Kid,” when that movie came out we saw an increase in kids coming into the school, between the ages of 7 and 12,” she said. Both instructors reported seeing a rise in female students, but Crone said his student base consists of about 40 percent female to 60 percent male. “More women are coming in now though,” he said. Both Crone and Smith agree there are several reasons why the rise in students has come about, mainly the upward trend of violent crime in the United States. “With the news, all the things going on out in society right at the moment that are making things seem a little less safe, people are wanting to come in to get a little bit more self-defense training,” Crone said. “Right now, the increase in new students, there was quite a few adults, more so than there has been in the past. Smith said the main issue she is hearing is the fear of gun control. “With the fear of their rights being infringed upon, their guns being taken away they are afraid, so they want to learn self-defense,” she said. Smith said news stories involving guns and abductions have inspired her to teach self-defense to different groups including Carlisle CARES and the Salvation Army, targeted to adults to teach situational awareness. She said she teaches a street-based system of self-defense with blocks, hits, pushes, grabs, chokes, locks, gun defenses and knife defenses, among others. Crone said many of his classes also provide the same lessons, and focus on building self-confidence and self-esteem, fitness, a good protective stance, eye-scanning patterns, to recognize threats and how to successfully defend yourself. Crone, who has worked with police officers and members of the military for years, said that while many people are going out and purchasing firearms for protection, knowing how to act against attacks without those weapons is also important. Knowing how to handle weapons, as well as knowing how to defend without them is extremely important, he said. Dragon’s Way will be offering a women’s self-defense class on March 15 at 6 p.m. For more information contact Smith at 218-5422 or www.carlislekarate.com. For more information on self-defense classes in New Kingstown, contact Crone at 691-4116 or online at www.cronestaekwondo.com.